The UHECRs Composition Problem: Evidence for a New Physics at 100 TeV? First the basics: We're talking about the ultra-high energetic end of the cosmic ray spectrum, with total energies of about 106 TeV. That's the energy of the incident particles in the Earth rest frame, not the center-of-mass energy of their collision with air molecules (ie mostly nucleons), which is "only" of the order 10 TeV, and thus somewhat larger than what the LHC delivers. After the primary collision, the incoming particles produce a cascade of secondary particles, known as a "cosmic ray shower" which can be detected on the ground. These showers are then reconstructed from the data with suitable software so that, ideally, the physics of the initial high energy collison can be extracted. For some more details on cosmic ray showers, please read this earlier post. The Pierre Auger Cosmic Ray Observatory is a currently running experiment that measures cosmic ray showers on the ground. One relevant quantity about the cosmic rays is the "penetration depth," that is the distance the primary particle travels through the atmosphere till it makes the first collision. The penetration depth can be reconstructed if the shower on the ground can be measured sufficiently precise, and is relatively new data. The penetration depth depends on the probability of the primary particle to interact, and with that on the nature of the particle. While we have never actually tested the collisions at the center-of-mass energies of the highest energetic cosmic rays, we think we have a pretty good understanding of what's going on by virtue of the standard model of particle physics. All the knowledge that we have, based on measurements at lower energies, is incorporated into the numerical models. Since the collisions involve nucleons rather than elementary particles, this goes together with an extrapolation of the parton distribution function by the DGLAP equation. This sounds complicated, but since QCD is asymptotically free, it should actually get easier to understand at high energies. Shaham and Piran in their paper argue that this extrapolation isn't working as expected, which might be a signal for new physics. The reason is that the penetration depth data shows that at high energies the probability of the incident particles to interact peaks at a shorter depth and is also more strongly peaked than one expects for protons. Now it might be that at higher energies the cosmic rays are dominated by other primary particles, heavier ones, that are more probable to interact, thus moving the peak of the distribution to a shorter depth. 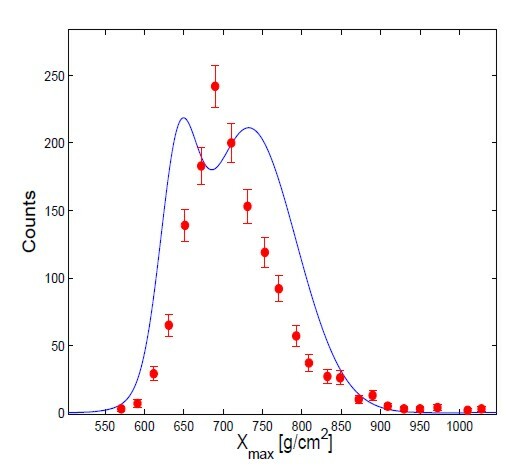 However, if one adds a contribution from other constituents (heavier ions: He, Fe...) this also smears out the distribution over the depth, and thus doesn't fit the width of the observed penetration depth distribution. Fig 2 from arXiv:1204.1488. Shown is the number of events in the energy bin 1 to 1.25 x 106 TeV as a function of the penetration depth. The red dots are the data from the Pierre Auger Collaboration (arXiv:1107.4804), the solid blue line is the expectation for a combination of protons and Fe nuclei. The authors thus argue there is no compositions for the ultra high energetic primary cosmic ray particles that fits the data well. Shaham and Piram think that this mismatch should be taken seriously. While different simulations yield slightly different results, the results are comparable and neither code fits the data. If it's not the simulation, the mismatch comes about either from the data or the physics. "There are three possible solutions to this puzzling situation. First, the observational data might be incorrect, or it is somehow dominated by poor statistics: these results are based on about 1500 events at the lowest energy bin and about 50 at the highest one. A mistake in the shower simulations is unlikely, as different simulations give comparable results. However, the simulations depend on the extrapolations of the proton cross sections from the measured energies to the TeV range of the UHECR collisions. It is possible that this extrapolation breaks down. In particular a larger cross section than the one extrapolated from low energies can explain the shorter penetration depth. This may indicates new physics that set in at energies of several dozen TeV." The authors are very careful not to jump to conclusions, and I won't either. To be convinced there is new physics to find here, I would first like to see a quantification of how bad the best fit from the models actually is. Unfortunately, there's no chi-square/dof in the paper that would allow such a quantification, and as illustrative as the figure above is, it's only one energy bin and might be a misleading visualization. I am also not at all sure that the different simulations are actually independent from each other. Since scientific communities exchange information rapidly and efficiently, there exists a risk for systematic bias even if several models are considered. Possibly there's just some cross-section missing or wrong. Finally, there's nothing in the paper about how the penetration depth data is obtained to begin with. Since that's not a primary observable, there must be some modeling involved too, though I agree that this isn't a likely source of error. With these words of caution ahead, it is possible that we are looking here at the first evidence for physics beyond the standard model. If there is a solar maximum and the atmosphere reaches out a bit further from earth, won't the penetration depth appear to be smaller? I assume airshower simulations will need the parameters of the atmosphere at the time the shower is observed? It would be interesting to know how they do that. "n a previous paper values of air density at heights from 200 to 800 km at dates between 1957 and 1962 were obtained from the rate of contraction of the orbits of the 38 satellites found to be suitable for the purpose. These and 8 further satellites have now been utilized to derive more values of air density, giving a total of 146 values at dates between 1957 and mid-1964. The results show the great decrease in density as solar activity declined during this time interval: at 500 km height, for example, the daytime density was fifteen times greater in 1958 than in 1964. The amplitude of the variation in density between day and night is also charted throughout the half-cycle of solar activity: in 1964 at 500 km height, for example, the maximum daytime density is about four times greater than the minimum night-time density." Perhaps there is an Unruh effect radiation interaction with the vacuum at extreme collision accelerations. Anomalies in high energy/nucleon heavy ion collisions in Brookhaven's RHIC/gold and CERN's LHC/lead may minimize given identical heavy nuclei merging. Pb-H bounce, anybody? A nice review of a paper whose subject matter I will now struggle to understand its significance. My hope being is that it actually does indicate new physics, yet I’m mindful nature has never been too concerned about anyone’s wishes. It is a very interesting claim. Of course because of itself, but also by what it would mean for particle physics. As of course you know in the actual paradigma of unification we would have electroweak breaking at around 1 TeV (and the almost discover of the Higgs, well, if it is not a radion after all xD) supports that idea. And form there we would have to go to 10^15 Tev of SU(5) (or another great unification group). In the middle energies there would be an absence of new physics and that would make problematic to justify a new great collider (specially if the LHC finally finds SUSY). But if we have the certainty of new physics at 100 TeV, which is far, but not too far, from the LHC maximum energy we would have a clear reason to make new accelerators, and that is very good if you must justify funding to not very intelligent people (aka politicians and economists ). Er, I read this morning the paper on the tablet and I had the idea to have read 100 TeV, now I see 10^6. Is my memory working ba or have you modified something about it? Penetration depth is being reported as grams/cm^2, so it is not the physical distance, rather it is probably (atmospheric density integrated along a path). That presumably takes into account the variations in the atmosphere. I wonder how that is measured, though. Need a primer on cosmic rays. Heavier nucleons have a shorter penetration depth and a narrower distribution of penetration depth. So in the figure 2, which was not clear to me, the first peak is Fe and the second, broader peak is protons. First chapter, Figure 3, for each energy range in the plots, X_max has a single sharp peak, which presumably cannot be obtained as the sum of two Gaussians in the way Shaham and Piran display in their plot. So it is clear that using Shaham and Piran's logic, at each energy range, there is new physics, because otherwise we would obtain their double-peak in Figure 2. If however any of the plots in Figure 3 can be obtained by two species of cosmic rays, say, protons and FE, then I don't see why any of the others cannot. The mean and width (RMS) of the proton and Fe cosmic ray penetration depth distributions are computed from various models, and are present in Figure 2 of the Pierre Auger Observatory paper I cited in the comment above. Eyeballing those curves, the proton mean is different from the Fe mean by about 70, while the proton RMS is around 58-60 and the FE RMS is around 20. So the peaks of the two component curves are separated by slightly less than the sum of the standard deviations. I expect almost any sum of fractions of proton and FE to be a two-peaked curve. I have been following this subject for a long time now. One has to consider the context of the LHC in it's investigations while one might ask about the composition of? I think to understand the decay products are following a course of energetic valuations and namings. I went here because I did not understand the climate debate and about microcosmic possibilities of the mini bangs producing a format for contributing to the nature of our own universe now. Our backdrops in experiments are many and so you produce Pierre Auger experiment while one may look to ICECUBE and wonder too?